Long Island’s oldest astronomical observatory is open every Saturday from dusk until midnight. Free and open to the public, enjoy a guided tour of the sky offered by observatory staff. The powerful telescopes will give you a view of the sky you rarely get to see and it’s wonderful to have an informed guide to answer your questions. Instead of looking up at the sky and wondering, “Which star is that?”…now you’ll know! The Customer Observatory also has a museum and library with informative exhibits and reference materials for the avid stargazer. Custer Observatory hosts a variety of fun and educational events. The next one at the observatory is the weekend of October 19-21. The observatory will have it’s 34th Annual Astronomy Jamoree which coincides very nicely with the upcoming Orionid Meteor Shower. The download a PDF for the full event program and registration details. Located at 1115 Main Bayview Road, there is bound to be a gathering of cosmophiles there for almost any celestial event. Visit the website, www.custerobservatory.org, for celestial events dates and a daily a clear sky forecast so you can look ahead to your Long Island vacation and know which nights will be your best bet for a clear view of the stars. Planning a Long Island Romantic Getaway? The Custer Institute is a 12 minute drive from the Arbor View House, a premier Long Island bed and breakfast and spa. We have 13 years of experience as one of the best bed and breakfasts in Long Island. Along with a stunning location, we offer three course gourmet breakfasts and great concierge services, all included with the cost of your stay. Now that the Holidays are over, it may be time for a romantic winter getaway to Greenport, Long Island and enjoy ice skating. 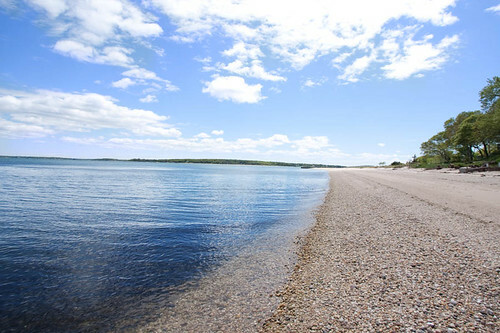 During your romantic getaway we encourage you to visit Mitchell Park which is located on four acres along the waterfront of the Village of Greenport. Mitchell Park is described as the “jewel” of the Village of Greenport and includes an observation deck and harbor walk and also offers a 60 slip marina. While activities at Mitchell Park vary according to the season, this is the time of year to enjoy ice skating! When I think of ice skating, I envision the romance and grace of skating and just how truly beautiful it is to watch and enjoy. The ice skating rink at Mitchell Park is open daily and they offer skate rentals for guests without skates. Also, if you have not been skating in a long time or have never skated before, they also offer private lessons. After an afternoon or evening of skating, return to the Arbor View House to enjoy some afternoon delights along with a relaxing aromatherapy bath and cozy fire. Or, take advantage of your romantic escape with a couples massage. Then slip into your fluffy bathrobe and cuddle in for the evening. You will have to agree that this is romance at its finest!